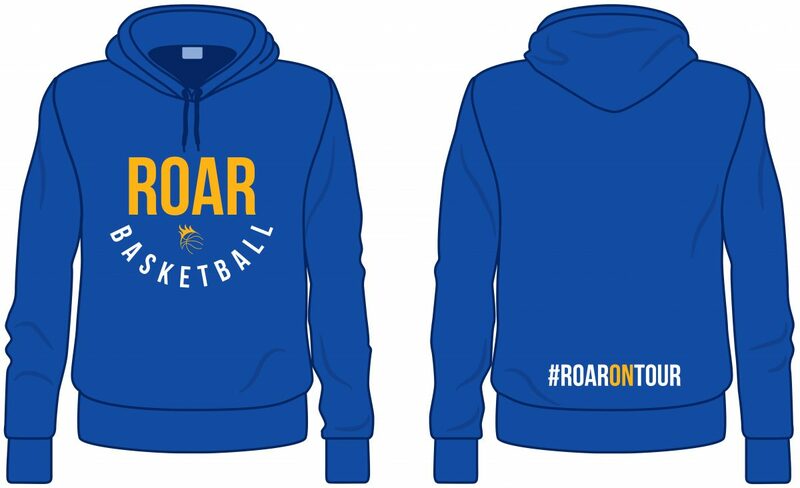 Exciting news for our ROARstars, Hoodies now available, with the freshest of designs. Youth sizes are Heavy Gildan, adult sizes are Ultra Heavy Gildan. These available not just for players but any member of the ROAR Family. For sizing, Gildan list large youth as 14yrs (although that is the size of Herefordshire Basketball hoodie BB has been rocking recently). Other sellers show the large as 10/11 – xlarge as 12/13. I think that’s more accurate. Youth sizes are (S)26″-28″ , (M) 30″-32″ , (L)34″-36″ , (XL)38″-40″. Maybe worth measuring a hoodie at home just to check. Even then one size up is probably best. These are being produced locally – we are really fortunate to have a supplier in Hereford so supportive – it does mean we are able to get great quality at a fair price. The hoodie is Royal Blue – initials will be printed high on the sleeve in yellow. If you would rather pay in person or would like to see an example hoodie drop in to the naked creative.